My son is off to school and my daughter is ready to get back to our normal routine. 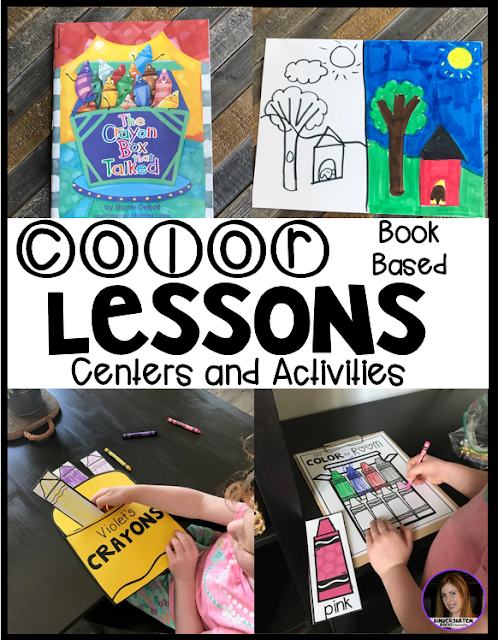 We loved learning about colors this week. 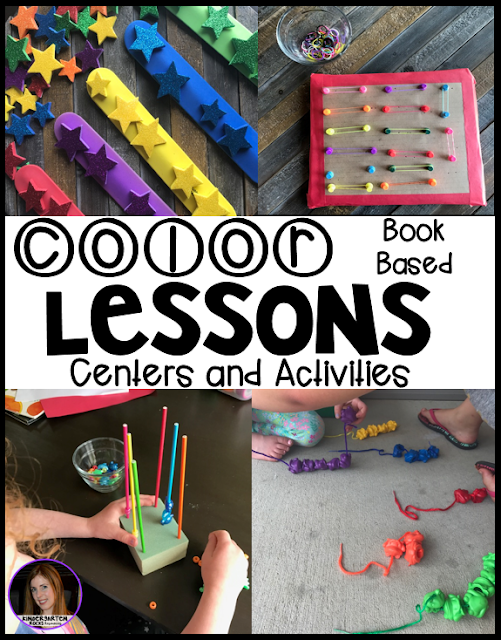 Some of our favorite books are tied into colors-it is easy to have a blast. Color identification is one of the first skills that children learn at home and work on in preschool so this is a great place to start! We love books in our house. Comprehension is a reading skill that starts long before a child actually learns to read. When you teach a skill or introduce a concept in isolation, there is no guarantee that a child will retain or remember it. 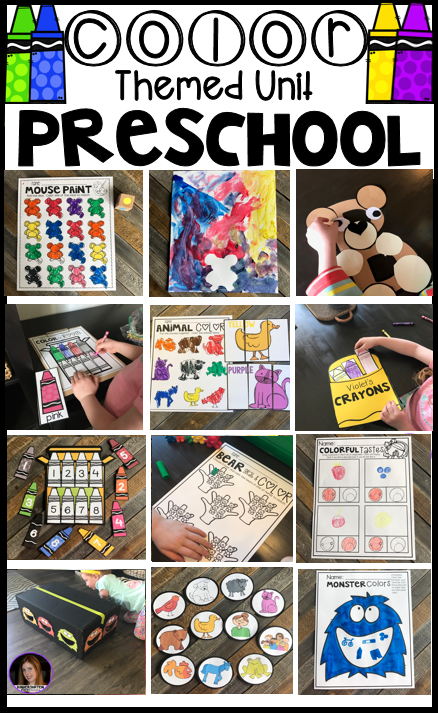 However, when you teach a skill or introduce a concept and intertwine it with stories, centers and the environment around a child, a child is more likely to remember and apply the skill. The more connections you give a child, the more likely the child will find a way to store and retrieve the information. That is why we based all of our color lessons around good stories. The first story we read was, Brown Bear, Brown Bear by Eric Carle. We have read the book so many times that V has it memorized. After reading the story, we reviewed the characters. Then, we closed the book and I asked her to help me order the characters. We used story prop characters on a homemade flannel board. Several of our favorite activities were coloring the characters to match the story. Prior to the activity I underlined the color word with the matching color. 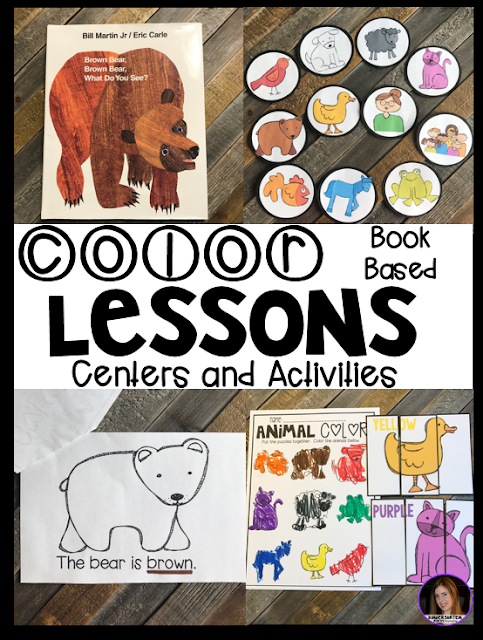 V was able to independently color the book. Click (here) to get this free download. She also loved putting the little puzzles together and coloring the matching character on printable. 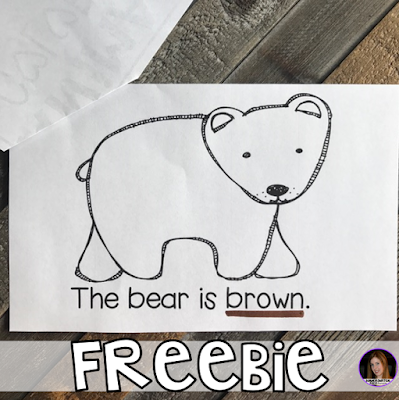 Throughout the week, we continued to review Brown Bear and started to work on the letter B. Prior to the activity, I placed toys that began with the /b/ sound in our living room. She raced around looking for /b/. As she grabbed a toy I would help her stretch out the sound and isolate the beginning. I would say “That’s a /d/, /d/, doll. does that sound like /b/, /b/ bear?” If it started with the /b/ sound she placed it in the basket. we also completed a “B is for Bear” craft. 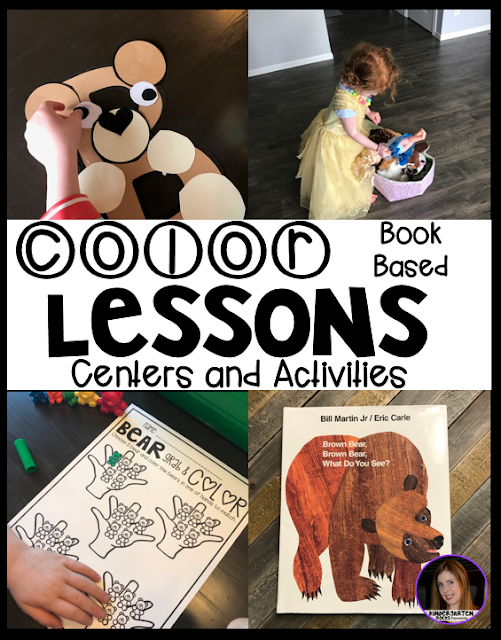 She was eager to do more activities, so she worked on Bear grab and Color. For this activity, she closed her eyes and choose 5 bears. Then she colored the bears to match on the printable. We also made a cute Brown Bear sensory book. This was by far our favorite. I printed the big book pages out. Then, she glued colored items to each character. We used, feathers, beads, tape, shredded paper and other fun materials. The next book we read was Mouse Paint, by Ellen Stoll Walsh. This was a great book to tie in a little science. 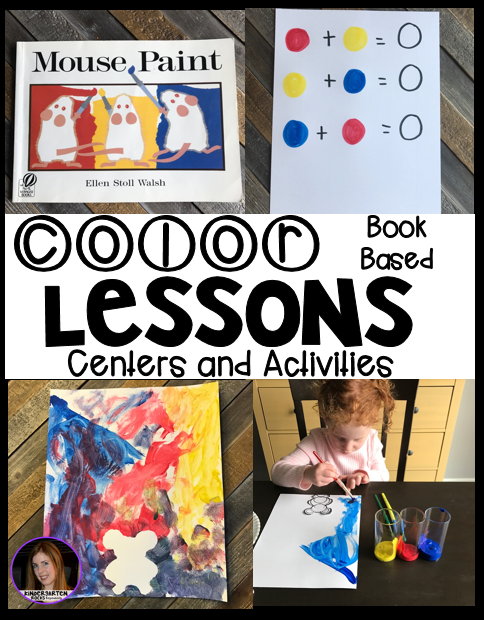 First, we read the book and focused on the color mixing. Then, V helped me fill out the color mixing chart. 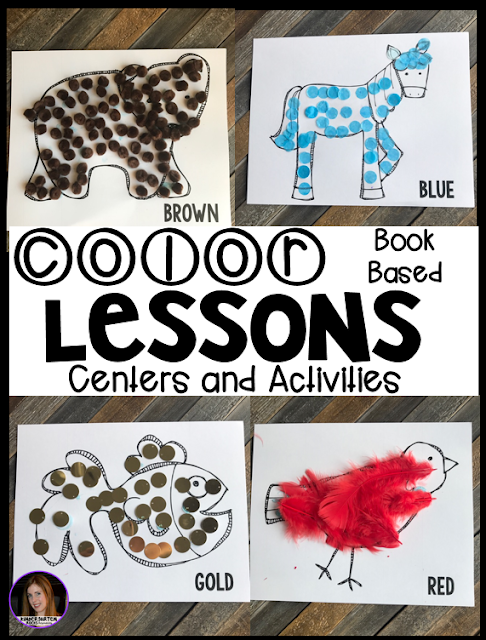 We used pages from the story to help us figure out, what color the mice made when they mixed each color combination. Then, V cut out a little mouse and we used painters tape to gently stick the mouse to the paper. Just like in the story, V mixed red, yellow and blue to make a masterpiece. We were thrilled to see that when we removed the mouse that we had left a little patch white for the mouse to hide from the cat. We loved reading The Crayon Box that Talked by Shane DeRolf. I love how we could tie quality pictures into this activity. As we read we discussed how the crayons didn’t like working together. On a sheet of paper I made a black line down the middle. On one side I drew a picture using one color. On the other side I drew the same picture using a variety of colors. V and I discussed which one we preferred. Then, V made her own crayon box using her three favorite colors. She also enjoyed searching our house for crayons I hid around the room. Our next story was, Rainbow Monsters, by Sylva Fae. Anytime a monster is involved V is extra excited. 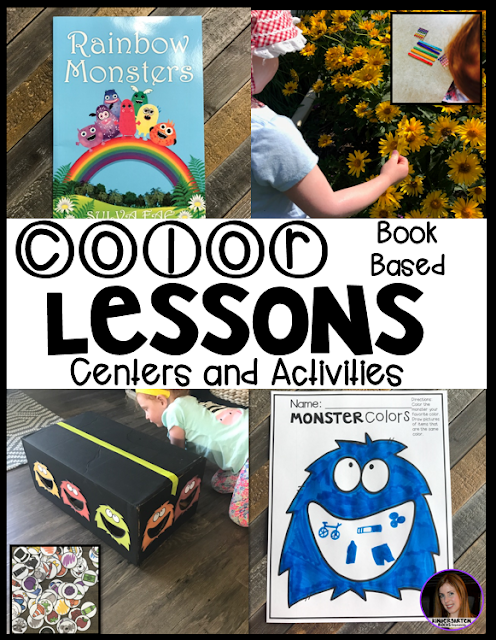 First we read Rainbow Monsters and discussed the colors of the rainbow and colors all around us. Then, for a fine motor activity, V matched colors by placing same-colored gem stickers on Popsicle sticks. Then, we used our Popsicle stick on an environmental walk and searched for items that matched. The big hit was our “Feed the Monster” game. I hid “cookies” (circles with colored objects from the environment) around the room. She would find the matching colored monster on the box and feed the monster the cookie after naming the object. Finally, V colored the monster her favorite color. I helped her draw a few of her favorite blue objects in the monsters mouth. Our final book for our color unit was Eating the Alphabet by Lois Ehlert. We discussed the fruits and vegetables and their colors. Then, I hid fruit and vegetables around the room from our Farmers Market Color Sorting game. V found and identified the fruit or vegetable and placed it in the matching labeled bucket. We searched through our refrigerator and discussed the fruits and vegetables we had and the colors as well. 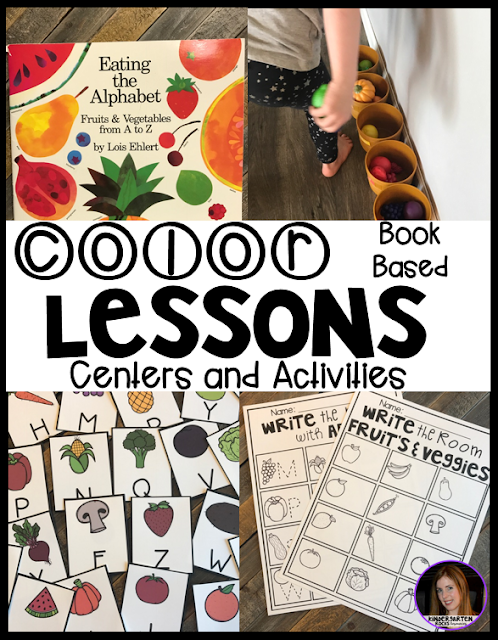 V had so much fun Searching the room for colors, we searched the room some more for letters. We did half of the alphabet one day and the other half the next. We also taste tested kiwi, pineapple, radishes and peppers. We talked about the importance of eating a variety of colored fruits and veggies. We had fun with our colored rice table. This is a fun activity to do outside:) I died the rice using gel food coloring and a tad of vinegar. The colors were so bright and inviting! I dumped colored beads and buttons for this cute trinket sort. V used the tweezers to pick up the buttons and sorted the variety of items by color. We also worked our little fingers with lots of sorting by color activities. We used beads, candy sticks, frog sorters, colored stickers and bracelets and hair bands and push pins for these fun engaging activities! We had so much fun with this color unit. It lasted us just about two weeks! 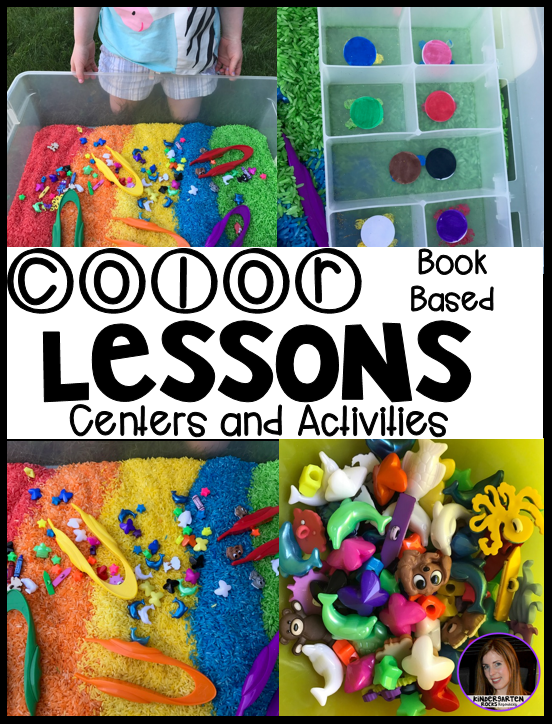 To learn more and get the directions, lessons and materials. Click here!